WALKING STICK MADE FROM OAK AND COPPER SALVAGED FROM BRITISH SHIP ROYAL GEORGE. The tapered oak shaft carved its entire length with floral leaf and other miscellaneous motifs. Part way down the shaft is a copper insert with a bored hold for attaching a lanyard. 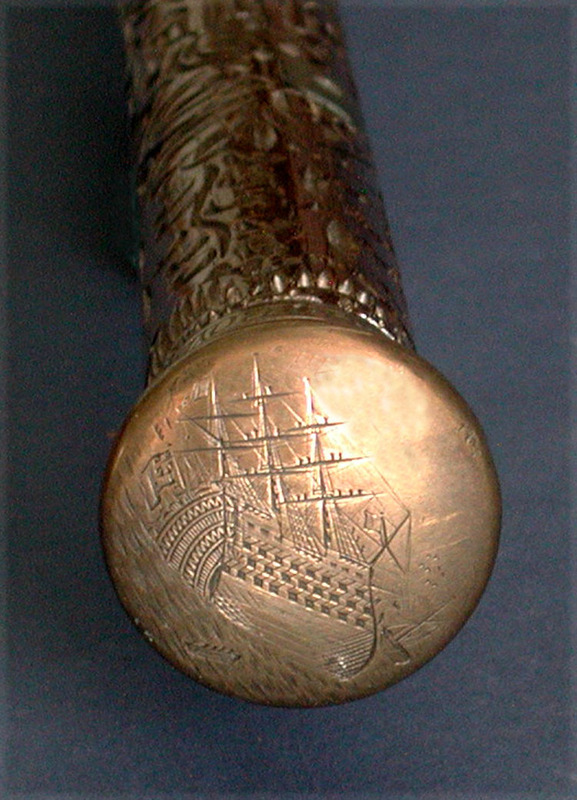 The 1 3/8" diameter copper handle engraved around the side "ROYAL GEORGE SUNK 1782 RAISED 1840". The very top of the knob with a quality engraved starboard view of the ship laying over on her side. Condition overall excellent.